The United Nations has launched a new trust fund to support a coordinated system-wide response from the UN and its partners to help Haiti overcome the cholera epidemic and support the establishment of strong water, sanitation and health systems in the country. 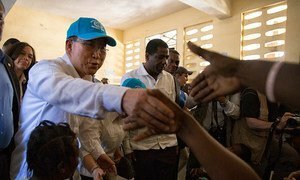 According to a news release, last Friday, Secretary-General Ban Ki-moon established the UN Haiti Cholera Response Multi-Partner Trust Fund (MPTF) to generate and manage resources to rapidly supply the UN system responses in the Caribbean country. The Trust Fund will direct the resources contributed by donors to the highest-priority activities of the system-wide approach, focused on intensifying emergency response to address cholera transmission as well as ensuring rapid access to effective care and treatment in parallel with investments to build sound water, sanitation and health systems, the best long-term defence against cholera and other water-borne diseases. UN Member States, regional bodies, inter-governmental organizations, businesses and individuals can make contributions to the trust fund. This past Friday at UN Headquarters in New York, Deputy Secretary-General Jan Eliasson briefed Member States on the issue, saying the first track of the new UN approach to tackling cholera involves intensifying efforts to treat and eliminate the disease; and the second track aims to develop a framework proposal to Member States for material assistance to those Haitians most affected by cholera after the 2010 outbreak. The new system-wide approach is also developing a proposal for a package of material assistance and support for those Haitians most affected by cholera. While early funding is urgently required to support the implementation of the new approach, the trust fund will also support other interventions, including responding to the increased risk of cholera caused by the devastation brought by Hurricane Mathew. According to the UN Office for the Coordination of Humanitarian Affairs (OCHA), more than two million people have been affected by the Hurricane and as of 15 October, close to 546 people are confirmed to have died, with at least another 128 missing. 1.4 million people across the island country need urgent lifesaving assistance and 750,000 people need urgent humanitarian aid for the next three months. Furthermore, since the outbreak of cholera in the country in 2010, an estimated 780,000 people have been affected and more than 9,000 people have died. See also - Fact Sheet: UN Haiti Cholera Response Multi-Partner Trust Fund (pdf). Haiti is facing its largest humanitarian disaster since the 2010 earthquake, United Nations Secretary-General Ban Ki-moon said today in Port-au-Prince, where he urged friends of the island nation worldwide to “step up” and provide the resources the Haitian people so desperately need in the wake of the “utter devastation” wrought by Hurricane Matthew.